The first show was in auditorium for 300 sixth graders at Petway Elementary School. Twenty chemistry students performed 15 demonstrations and gave scientific explanations of how each one worked. The demonstrations were arranged in order of their state of matter, liquids, solutions, gases, and heat. The second show was held at St. Mary’s Elementary School for twenty-five third grade students. 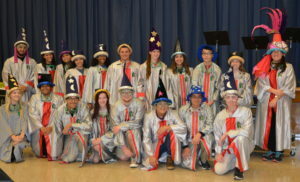 This show allowed more direct interaction with the students, who volunteered to assist the “wizards”. A simpler explanation of the four ways to recognize chemical reactions have occurred was offered. 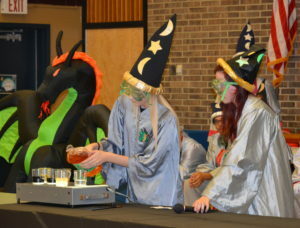 Our chemistry wizards concocted potions, powders, and vapors for the elementary students. Each experiment demonstrated one of the aspects of a chemical change: formation of a precipitate, permanent color change, heat lost or gained, evolution of a gas. 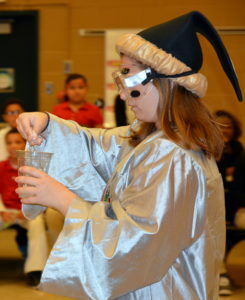 The third show was a series of five demonstrations, presented hourly, at the Second Annual Super Science Saturday held at Vineland High School. Parents, teachers, and students from district elementary and middle school were invited to attend free of charge. The Vineland ChemClub also sponsored several hands-on tables including Cartesian Divers, Conductivity and Electrolytes, Surface Tension, Density, and pH Indicators. Total attendance was more than 500 people. This year we introduced new experiences like the conductivity/electrolyte and Cartesian Diver demos – not to mention the ever popular “Whoosh” bottle. It was also the debut of the club’s new mascot – a 7 foot inflatable, glowing dragon named Bunsen.